SusieQTpies Cafe: Craziest family photo disaster! Get Shutterfly photo tips! Craziest family photo disaster! Get Shutterfly photo tips! Do you have the craziest family photo disasters to share? If so I'd love to hear about it. Our family had one that none of us will ever forget! To ring in the new Millennium, 22 of us went on a cruise together. It was a huge family reunion and it was a blast! On New Years Eve we all dressed in our finest clothes, yes, dress and tux, pantyhose and uncomfortable shoes, the whole works! We even had the 10 month old all dressed up and past her bedtime to take this photo on the cruise ship. The photographer took all the individual family shots first and then on to the large family photo. All went well, we smiled and snap went the camera! The baby went to bed and the rest of us partied like it was the last day of 1999, which it literally was for us! The next day we were given our photos to look at so more could be ordered and guess what? All the photos were perfect EXCEPT the 22 member family photo. The family photo was nothing but a blurry mess. Really no focus at all. This was very frustrating because how do you recreate that photo where everyone looked so beautiful? They did a reshoot of our photo but we were all in regular cruise clothes and the scheduled time didn't work for the baby so she was left out of the photo! Now that I look back, almost 12 years later, I really think that we should have made it a fun photo. We should have had props and looked like it was the meant to be photos. I would have LOVED to have held (and then drank) a tropical drink with a cute umbrella! We could have had our snorkel gear, beach balls, sunglasses, etc. But...we didn't! We all just sat there, smiling, thinking about why we had to retake this photo. I do wish that the photographer would have helped make this a fun occasion instead of something we were all dreading. Mistakes happen when you don't want them to and over the years I have learned to go with it and enjoy it all. Most of us wanted these photos to make photo gifts for family and friends, which we did. Remember when taking photos, especially for gifts, have fun with it! Get props and just have a great time. Relax and let it happen! 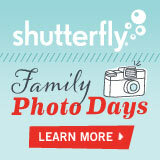 Speaking of photo gifts, have you heard about the Shutterfly's Family Photo Days? Shutterfly wants to help prepare you to take the best photos possible and then turn those photos into wonderful holiday cards for your family and friends. Click the link and learn how to organize, to participate and to create a fun family photo day! I loved all the tips and plan on using some of them for our yearly family of 5 photos. Disclosure-I was compensated by the Global Influence Network for this post. My own tasty opinions are expressed here.